With the time the color of your hardwood floor fades and you need to refinish it in order to put a new stain color on the wood. Staining hardwood floors the right way can results in long years of trouble free enjoyment. The process starts with surface preparation by cleaning up, vacuuming and then using a power sander. To operate the power sander is very hard and require special skill, that’s why it is not a good idea to try doing it yourself. Another thing, if you want to save money, you can try to stain and seal yourself just follow the instructions from stain and seal from manufacturers. After sanding the floor, the surface should look if not perfect then at least very close to it and any imperfections on the surface can be filled by using wood putty or pores may be filled by using wood filler. The process of applying stain is mostly same regardless of the wood's purpose just be careful in areas where it is harder to reach or on stairs. Stain penetrates deep into the hardwood in order to color it but it doesn’t really protect the wood form damages and other impacts. That’s why you should still put a few coats of a finish in order to make your floor be more durable and long-lasting. If you prefer more natural look of wood then go with a transparent or semitransparent stain. That way your wood grain will be seen enhancing the natural beauty of the wood. In contrast, you can buy an opaque stain in order to make the grain invisible. There are many stain color to choose from when it comes to a hardwood floor. Opaque stains are available in a rainbow of colors and other stain options can vary widely from natural wood to dark browns and black. However, remember that different manufacturers use different colors and names for that, so don’t expect to find exact the same colors in different stores. You can customize two or a few colors together by using trails and errors method. Another option you can ask you installer of the hardwood floor to make some sample options for you in order to compare them. You should consider that imperfections will be more visible with darken colors. However, some people think that darken colors will make your room more modern compare to lighter ones. Some customers choose dark-brown colors for their floor if they have big window/windows in the room otherwise the room will look too dark and cold. Other thing to think about is that species of hardwood effects the way the floor will take stain. In other words, totally the same stain on different species samples will look a lot differently. How to stain hardwood floor? As was mentioned above, after preparation process (the sanding, buffing, vacuuming, and clean up) you can wet the floor a little bit with the sponge or rag in order to help your stain to penetrate into the wood faster and better. 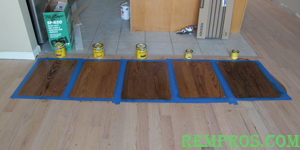 Then you can apply one coat of desired stain and wait until it thoroughly dries. Last step is to put one or a few coats of the sealer depending on the type of hardwood floor finish. If you hire a professional installer to stain your floor then you shouldn’t worry about anything. However, if you plan to stain and seal the floor yourself then you should follow instructions on the stain cans carefully because they can be dangerous for your health. You should use them only in well-ventilated rooms. In addition, you should have and use rubber gloves and a face mask when applying them on the surface.